In this quote from Sep 1776, Coulomb, then a captain in the corps of military engineers, is suggesting how to keep the talent of military engineers in general intellectually engaged. But it also may reflect his own pending readiness to make a career change. He went on inactive duty in 1781. It is a significant turning point in his life, for it gave him the time and freedom to pursue physics research in his later years, and produce the body of work on electricity and magnetism for which he is now famous. As a graduate of the École du Corps Royale du Génie, Charles-Augustin Coulomb began his career as a military engineer officer, and spent eight years assigned to supervise construction of fortifications on the island of Martinique. While there, he diligently developed mathematical analyses of the four “classic” eighteenth-century problems of civil engineering: the strength of columns and beams, the thrust of soil, and the thrust of arches. He wrote a book-length Mémoire of his solutions to these problems, which he first read to the Académie Royales des Sciences on 10 Mar 1773, the year after he had returned to Paris. It was published in 1776, and remains a significant contribution to civil engineering. In Sep 1776, Coulomb responded to a request for suggestions for a reformation of the corps. Now a captain, Coulomb reflected on a better way to utilize manpower during peacetime. He sent a memorandum to the minister of war, the comte de Saint-Germain. Thus, making a decisive break in his life and career, Coulomb was ready to spend his time finding a wife and raising a family, and used his engineering skills as a consultant in civil projects. Meanwhile, having been elected to a vacancy in the Académie Royale des Sciences, he also pursued researches in physics. It was at this later time in his life that he produced the work in electricity and magentism for which he is most remembered. He began presenting that research to the Academy in 1785. His now famous extension of the inverse square law to electrostatics and magnetic forces was not fully appreciated until after his death in 1806, when further investigations (1808-25) by Simeon-Denis Poisson and André-Marie Ampère fully revealed its importance. 1 Charles Coulston Gillispie, Science and Polity in France: The End of the Old Regime (1980, 2004), 530. 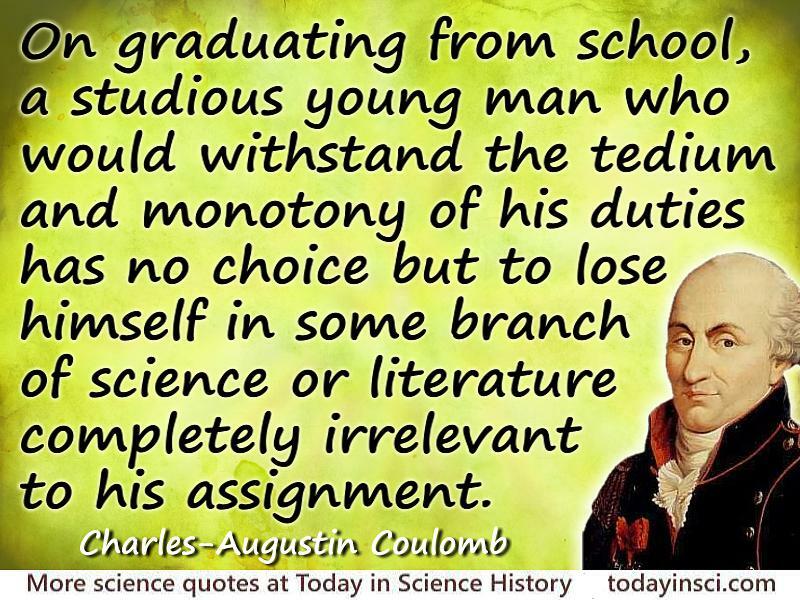 Science Quotes by Charles-Augustin Coulomb.